Connections and relationships are the foundations of our Kindergarten. At all levels, relationships are woven. They all exist with the common focus of enriching early childhood development and the memories of the children who attend the Preschool. These woven relationships throughout the Kindergarten community, inspired the visual theme of 'Tapestries of Childhood'. Tapestries are beautifully rich and lovingly crafted. The main visual shapes in our identity are inspired by a ball of wool, a base material that can be used to create tapestries. It is made from a layered grouping of 5 different coloured strands. Each of the colours used: Leaf Green, Ochre, Mud Brown, Sand and Ocean Blue represent the different groups that make up our Kindergarten family: 1) Management Committee, 2) Staff, 3) Families, 4) Children, and 5) The broader community. As each of the connected layers are joined, the strength of the colour deepens representing these rich relationships. The resulting shape is much like a flower blossom, just like the children who attend our Kindergarten – learning, discovering and exploring through play based experiences. 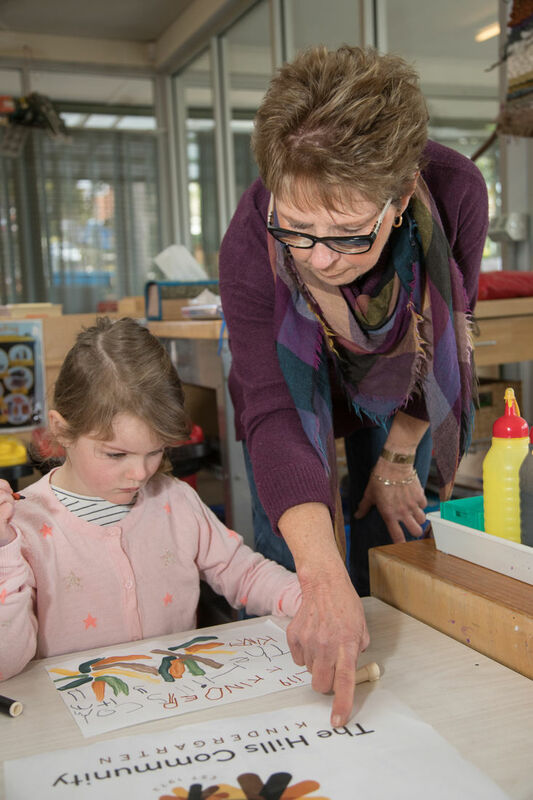 Children’s time at Kindergarten aims to develop independence, confidence and to transition them to formal schooling with a good sense of who they are. The large blossom and the small blossom come together representing the educator/child relationship in nurturing the children’s development.